Cullman CDJR is located just north of Birmingham, Alabama. General Manager Scott Spitzer faces the same problem as many other dealers – how to best allocate marketing spend to attract new sales and service customers. In the past, he relied on individual initiatives such as direct mail or the occasional phone campaign. Spitzer was also disenchanted with marketing vendors that blast out email campaigns to 100,000 untargeted contacts instead of just to auto intenders. After discussing targeting methods and marketing strategies with his Business Development Manager, Spitzer decided to try Affinitiv’s Connectiv Prospect, a digital-only sales and service conquest solutions that combines email and social media advertising with optional display advertising and geo-fencing. Using a combination of demographic data, online activity and predictive analytics, Affinitiv has the industry’s largest auto intender database. It contains customers who indicated they will purchase within 120 days. 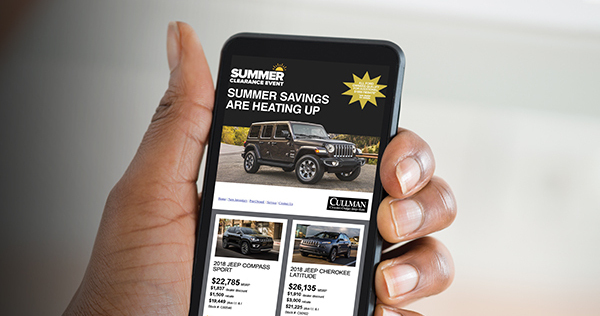 Cullman CDJR decided to target lapsed customers as well as new prospects with email and social campaigns. After only 4 months, Spitzer began seeing results. Plus, the solutions is cost-effective with campaigns focused on his two target audiences – auto intenders & lapsed customers. Affinitiv recently added Instagram ads to Connectiv Prospect. Cullman CDJR piloted the new feature and in one month, social media impressions doubled.